Feud’s most amazing accomplishment is translating these larger-than-life creatures and breaking them down to the most basic human emotions. Envy. Despair. Isolation. In the very first Feud episode, Olivia De Havilland (Catherine Zeta-Jones, who moves up from being just a talking head in this episode) explains that feuds are about pain. This episode, maybe more than any other so far, exposes the raw feeling that led these women to act the way they did, and does it so well that these inexcusable actions almost seem explainable; certainly, all the women involved had reasoning for their actions. Well, we all do. Joan is the first to crack, in a luxurious purple caftan by the pool when she explains just why being left off the Oscar list was such a slap in the face. When Sally Field enthused, “You like me… you really like me,” she wasn’t kidding. The Oscars can primarily be a popularity contest. And given the choice between the two of them, Hollywood picked Bette Davis over Joan, even though she was never the town team player the way Joan was. To get that kind of rejection at such a final stage in her life, for someone with a self-image as fragile as Crawford, must have been beyond brutal. 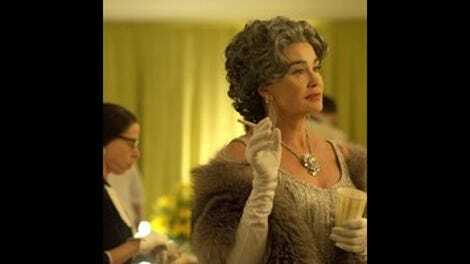 Judy Davis’ Hedda Hopper gets a platform as well, to explain that her poison pen is actually Hollywood’s moral compass, and she’s given up her own acting career, and any dreams she had of having a family, to create it. But it’s Bette’s devastation that hurts most of all, because she’s the ultimate loser in this scenario. I hadn’t realized how much she wanted that third Oscar, and how much of a favorite she’d been before Crawford and Hopper started campaigning against her. Bette knows she’s cooked as soon as she sees Crawford’s green-room party: She wouldn’t be celebrating so much if she didn’t have something very large concocted. I think I go on about Susan Sarandon’s performance every week, but wow: That moment when Anne Bancroft’s name is announced. It was like she was taking a bullet in her side. Just devastating. Even more so as it follows the moment when Davis reflects on the moments when she won her two Oscars, when she says she felt like the entire world loved her. As always, Sarandon carries the emotional weight of these moments, making the viewer feel them as acutely as Bette Davis likely did herself. In an interview with People, Sarandon calls the Oscar pull a “breaking point” in the Davis-Crawford relationship; not that they were every really close, but any chance they ever had to be closer were destroyed by Crawford’s petty actions that night. It’s also interesting how easily the younger actresses—Geraldine Page and Anne Bancroft—almost immediately clue in to what Crawford is asking for. At the start of their careers, Page and Bancroft could afford to be generous, and not just a little sympathetic. It’s sadder for Page since she didn’t even win, and in fact was snubbed by the Oscars herself seven times before finally winning for The Trip To Bountiful in 1986. As actresses, they get how much that public persona means to Crawford. It was her last chance to make a dramatic statement as queen of the ball that night. And you have to hand it the costume and makeup department: They totally nailed her whole sliver star thing. Ryan Murphy is quoted in that same People interview, saying that he hopes that Feud will inspire people to be nicer to each other. To that end, the relationship between Davis and De Havilland is a nice juxtaposition to Bette and Joan. They supported each other at the beginning of their careers, and could help each other without competition. Even in Hollywood, these two showed it was possible. Joan and Hedda are less successful, and more like co-conspirators, taking Davis down to satisfy their own petty aims. Because what does that get you, really? For all of Crawford’s mastery that night (love how she marches through every room backstage—even the men’s room—like a boss), her victory is fleeting. She can set it on her bedside table, but it’s not really her Oscar. And the thing she fears the most—being alone—is still staring her right in the face. Having conjured up so much ill will, she’s actually in a worse position than when the nominations were first announced. Guess “karma” wasn’t a word that got bandied about much in 1963 Hollywood. This episode is one that Ryan Murphy both wrote and directed, and when he commits completely to a project, it shows. The showy reflective shots of De Havilland in the mirror. The breathtaking shades of Joan and Hedda’s dresses against Joan’s colorful home. The real affection between pretty much the only positive relationship we’ve seen on this show: Olivia and Bette. By so carefully dissecting this singular Oscars incident, Murphy masterfully explains the reasons behind the feud’s amplification, and even manages to wring out some sympathy for all of our leads while he does it. It might be my favorite thing he’s ever done. Aw, they couldn’t get Toby Huss to come back as Frank Sinatra to do at least one Oscar hosting scene? He was so good last week. Page and Bancroft also differed from Davis and Crawford by having long-lasting marriages with two famous husbands. Bancroft was married to Mel Brooks, and that’s Cash Black as a young Rip Torn in Geraldine Page’s apartment. Didn’t really understand what Cukor was trying to talk Joan out of the night of the awards. It was kind of past the point by then, right? Guess he just had to show how displeased her actions were bound to make her in Hollywood community: Nobody seems that excited to take a picture with her that night. According to IMDB, Joan Crawford reportedly said, “Excuse me, I have an Oscar to accept,” right before walking past Bette Davis. Maybe Ryan Murphy thought that particular line of dialogue would just be too cruel? That cigarette crush was pretty epic, though.